The Tibetan word rdo rje is an equivalent of the Sanskrit word vajra, literally translated as thunderbolt, which destroys but is itself indestructible. In Buddhist tantra the word generally signifies shunya or void, which cannot be destroyed, but destroys all evils. When two vajras are crossed the combination is called a vishva-vajra or a double vajra, as this ritual implement. 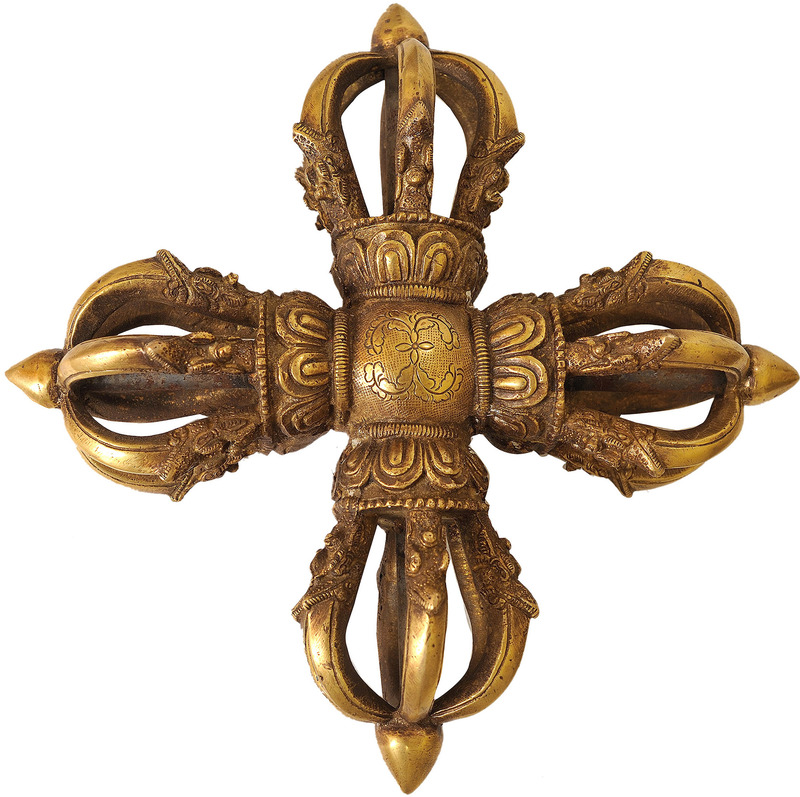 This vajra has four sets of six prongs each with the central shaft, running end to end of each vajra, making up the seventh prong. The seven prongs represent the seven human Buddhas (Vipasyi, Sikhi, Vishvabhu, Krakuchanda, Kanakmuni, Kasyapa and Shakyamuni). Each of the six outside prongs issue from the mouth of a makara, symbolizing that all beings are held by the vajra in the firm grip of compassion. Here the symbolic meaning of firmness and unshakeability are implied, as the crocodile proverbially will not release its jaws until its prey is dead. Below each set of makara heads is a common lotus petals base, which symbolizes wisdom, perfect knowledge of reality and transcendence. It is generally believed that the vajra evolved from the representation of the trident-shaped thunderbolt of the Hindu god Indra and it was Padmasambhava, the Indian Buddhist teacher who introduced the vajra into Tibet. This description by Dr. Shailendra Kumar Verma, Ph.D. His doctorate thesis being on the "Emergence and Evolution of the Buddha Image (from its inception to 8th century A.D).